Yesterday was truly one of the saddest days of my life. Monday August 10th God took our beautiful son Titan Douglas Johnson home to Him. Titan may have just been a dog to some but to us he was as much a human being as we are. He loved life and lived it to his fullest. He was our daughters protector, he was our nurturer if any of us were sad, lonely, or sick. He was our best friend who would never turn down play time, a long walk, a run or wrestling. He knew just how to communicate with us to let us know simple things such as going outside, or that he was hungry. When he was ready to come inside, he would knock on the door. In the cold winter months, he would stand in front of the TV as if to say, hey, I'm talking to you. You had no choice but to look at him, and then he would shiver, stop, then shiver some more. Then he would look from you to the fireplace, back to you and back to the fireplace, and then, another shiver. There was no way you could not turn the fireplace on for him because he would refuse to move from in front of the TV. Titan was superfast and would run alongside our vehicles at 40km an hour, never missing a beat, and if he did, ouch, his bum would skid on the ground and yet somehow he would manage to get his feet back under him and still be moving right along. He was just like a human though, doing a quick embarrassed look around as he was in midskid to see if anyone saw it. Titan was spoiled the last few years of his life. Since we know that a Great Dane's lifespan is not all that long, we couldn't deny him all the love and affection we could lavish on him. 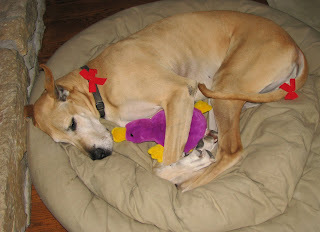 He moved into our bedroom with us, his ginormous bed beside ours, with his purple ducky. He loved pizza and always managed to weasel a piece from us, and on weekends he was treated to toast and jam at breakfast with us. Some days we made you 'work' for treats. We would stand up and you would stand up too on your back legs, your front paws on our shoulders, towering over us. We would hold food between our teeth and ever so gently you would take that food from our mouth. For all those who posed no threat to our daughters, Titan will be remembered by them as a wonderful dog, gentle and kind in nature. For those who got between our girls and Titan, they will remember him as one big mean dog who could keep them cornered for hours until someone came to their rescue. For his little dog friends, they too will remember him as their protector, keeping them safe from larger dogs. Even the otter down the road who fought constantly with Titan will miss his regular visits. Titan was furiously loyal, loving and the best son and friend a human could ever have or want. Titan you are imprinted in our hearts and on our minds forever. You gave us so much laughter and joy in our lives. You had an absolutley amazing personality, you had the attitude of a child, the rebelliousness of a teenager. You had an amazing character and you were so incredible in every way. You have given us love and have taught us love. You have been such a precious gift from God and we know you are with Him in His heavenly kingdom, watching over us. My deepest condolences Margaret. He was a sweet dog. Oh Margaret, I am so very sorry for you and your family! You were fortunate to have had him in your life and he was so lucky to have had your complete love. I was sorry to read about your dog passing away. I am sure he gave as much love as he received. I know a pet is like a family member - that is how I feel about my dog Duchess and I'm sure the loss was a very sad time for you. How wonderful that you have filled the empty space with another gorgeous dog! I'm sure they are different, but equally as fun to have around. All the best as you welcome your newest family member into your home and lives.